In Citizen Hearst, which screens for invited guests at Houston's Asia Society Texas Center tonight, Academy Award®- and Emmy®-nominated director Leslie Iwerks (The Pixar Story, Pipe Dreams, Recycled Life) explores the 125-year history of Hearst Corporation, from William Randolph Hearst's conviction that print newspapers could boldly inform public opinion, to the global impact of the company's multimedia brands and diversified businesses today. The film is narrated by Academy Award®-nominated actor William H. Macy and had its world premiere the 2012 Hamptons International Film Festival on October 5. The film is now on the festival circuit and a wide release is planned for 2013. The iconic nature of W.R. Hearst-an important and indelible part of American history -- has long enthralled the public, and was famously dramatized in the 1941 film Citizen Kane, starring Orson Welles. Citizen Hearst, produced by Iwerks and Jane Kelly Kosek, is the first in-depth look at how the company has navigated the changing times over the span of two centuries. Crafted from interviews and historical footage, Citizen Hearst features the personal stories and trials and tribulations that have made today's Hearst Corporation. Featured interviews include Hearst executives and editors, including Frank A. Bennack, Jr., CEO of Hearst, who has led the company longer than any Hearst executive other than W.R. Hearst himself; Oprah Winfrey; Mark Burnett; Ralph Lauren; Donna Karan; Dan Rather; Bob Iger; Leonard Maltin; Dr. Oz; Heidi Klum; Nina Garcia; Timothy Greenfield-Sanders; and several descendants of W.R. Hearst, among others. The film chronicles the rise of American journalism and Hearst's newspaper rivalry with Joseph Pulitzer; traces the beginnings of newsreels and films, and later magazine brands and cable; glimpses inside the personal lives of W.R. Hearst and Marion Davies (including reactions to Citizen Kane); explores the influences of media on politics through the decades; investigates Hearst's steadfast pursuit of creative expansion; and examines the bold commitment the company made in a changed media world to building Hearst Tower in the wake of 9/11. Viewers will get a never-before-seen view of the company, from behind the glass exterior of New York's Hearst Tower to inside the famous Hearst Castle near San Simeon, Calif.
"Citizen Hearst explores the creative genius and sharp foresight that has been handed down from one Hearst leader to the next, all in the pursuit of innovation across all media platforms," Iwerks says. "Hearst has always believed in its creative people to build and expand the organization. The film follows the thread that began with the unprecedented vision and risks of William Randolph Hearst and continues under the leadership of CEO Frank Bennack today." Commenting on the film, Frank A. Bennack, Jr., CEO of Hearst Corporation, says: "It is clear today that we are a very different company than 125 years ago, but in one sense Hearst has not changed at all: Our mission is still to inform, entertain and inspire. This is the first time our story is told in film, from William Randolph Hearst's first Examiner edition to the global information company we are today. 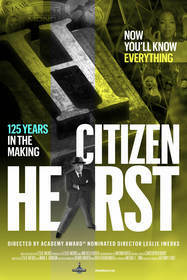 Citizen Hearst is a documentary 125 years in the making -- we are all 'Citizen Hearsts' in a sense, informed by journalism and media that W.R. Hearst is responsible for creating." Visit citizenhearst.com for more information on film, including details on upcoming screenings. Find the film on Facebook at facebook.com/citizenhearst. Leslie Iwerks Productions, Inc. is based in Santa Monica, Calif., and over the last twelve years the company has produced award-winning documentaries, television specials and digital content for Disney, Pixar, HBO, Starz, Bravo, National Geographic, Babelgum, among others. Iwerks' short documentary Recycled Life was nominated for an Academy Award® in 2007, and The Pixar Story a feature documentary about Pixar Animation Studios, was nominated for an Emmy® in 2008. Her short documentaries Downstream and Pipe Dreams were both shortlisted for Oscars. Iwerks' latest television documentary, Industrial Light & Magic: Creating the Impossible aired on Encore last fall and included George Lucas, Steven Spielberg, JJ Abrams, Ron Howard, Robin Williams and was narrated by Tom Cruise. The company is currently in development and production on a number of short and feature-length documentary and narrative projects; visit www.leslieiwerks.com for more information. Celebrating its 125th anniversary, Hearst Corporation (www.hearst.com) is one of the nation's largest diversified media and information companies. Its major interests include ownership of 15 daily and 36 weekly newspapers, including the Houston Chronicle, San Francisco Chronicle, San Antonio Express-News and Albany Times Union; hundreds of magazines around the world, including Good Housekeeping, Cosmopolitan, ELLE and O, The Oprah Magazine; 29 television stations, which reach a combined 18 percent of U.S. viewers; ownership in leading cable networks, including Lifetime, A&E, History and ESPN; significant holdings in electronic and medical/pharmaceutical industries; a 50 percent stake in the global ratings agency Fitch Group; Internet and marketing services businesses; television production; newspaper features distribution; and real estate. Follow us on Twitter @HearstCorp. Citizen Hearst explores the 125-year history of Hearst Corporation, from William Randolph Hearst's conviction that print newspapers could boldly inform public opinion, to the global impact of the company's multimedia brands and diversified businesses today. Crafted from interviews and historical footage, Citizen Hearst features the personal stories and trials and tribulations that have made today's Hearst Corporation.